Once again Yalda, one of Iranian’s much loved and cherished celestial moments and rituals is round the corner. We celebrate Yalda on winter solstice on Dec. 20th as the longest and darkest night of the year by getting together, reciting poetry and feasting over a colorful spread of dried fruits and nuts, aajil, specific fruits namely pomegranate, persimmon and watermelon, cozy heartwarming dishes and lots of light, hope and energy to get through the long but increasingly brighter winter ahead. 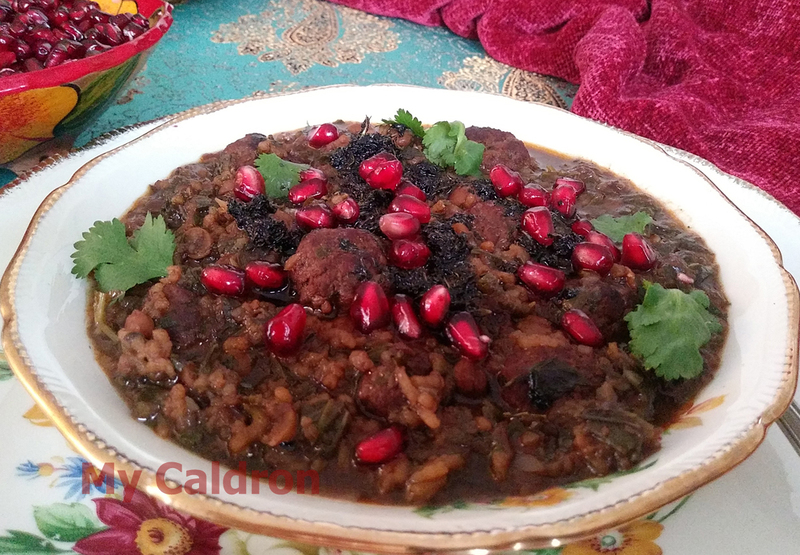 See my precious posts for Yalda night here and here. The Persian “Pomegranate Soup” or ash-e anar آش انار, will forever resonate with me the excellent culinary fiction by the same name written by Marsha Mehran, an eloquent Iranian-Irish author who passed too soon but whose novels depicted Persian cuisine enchanting as a fairy-tale full of texture, fragrance and mystery always ready to haut, charm and welcome those unfamiliar with it. 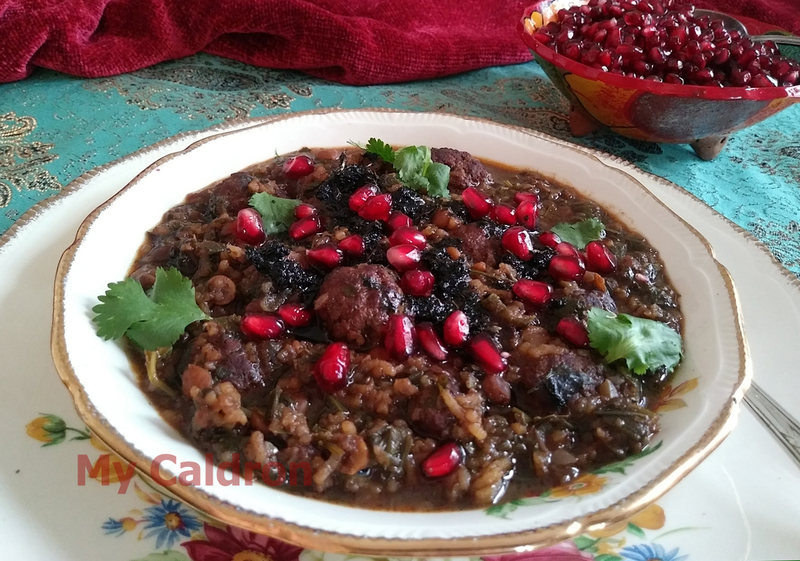 Ash-e anar is a hearty and flavorful dish with lots of fresh herbs as well as split-peas, rice and stuffed little meatballs. Its unique sweet-sour flavour is owed to pomegranate molasses which you could purchase from Middle Eastern or Iranian stores. Rinse split-peas and drain. Use a medium pot to mix split-peas, 2 cups of water and a pinch of salt. Bring to a boil then cook over medium heat until cooked at core and almost all the water is absorbed. Drain and set aside. Combine ground meat, grated onion, half your minced garlic, ¼ cup of mixed herb, chickpea flour, a pinch of turmeric, salt & pepper. Use your hand and fingers (not a blender) to massage and mix them very well. Then, make it into a large ball and leave to rest in the refrigerator for 10 minutes. Make this large meatball into several ping-pong size meatballs. Heat 2-3 tbsp. oil in a pan and sauté the balls over high heat till brownish. Shake the pan a few times so all sides of the meatballs are fried. Place them on a paper towel to absorb excess oil. Add meatballs and pomegranate molasses to the pot and cook for another 20 minutes. Adjust the thickness by adding more water if necessary and taste for adjustment. Heat 2 tbsp. oil in a small pot then add dry mint for a minute or two just so it gets slightly darker in color ; this is your nana dagh, the favorite garnish on many Persian foods. Serve ash in a big bowl, drizzle with fried mint and pomegranate seeds for extra color and bite! Have a wonderful Yalda and keep warm!